After almost two decades of discussion, the ASEAN Economic Community (AEC) will be proclaimed on 31st December. The AEC is a potentially significant and competitive economic region, should it be allowed to develop according to the aspiration of being a “single market and production base, with free flow of services, investments, and labour, by the year 2020”. 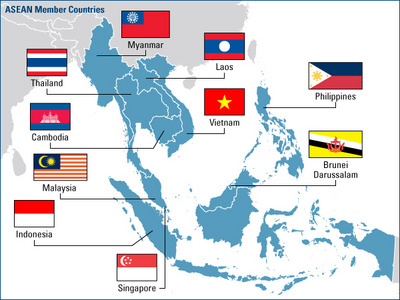 The ASEAN region as a composite trading block has the third highest population at 634 million, after China and India. GDP per capita is rapidly rising. The AEC would be the 4th largest exporter after China, the EU, and the United States, with still very much scope for growth from Cambodia, Myanmar, the Philippines, and Vietnam from a diverse range of activities ranging from agriculture, food, minerals and commodities, electronics, and services. The coming AEC is already the 4th largest importer of goods after the United States, EU, and China, making it one of the biggest markets in the world. Unlike the other trade regions, the AEC still has so much potential for growth with rising population, rising incomes, growing consumer sophistication, and improving infrastructure. Perhaps the biggest benefit of the upcoming AEC is the expected boost this will give to intra-ASEAN trade. Most ASEAN nations have previously put their efforts into developing external relationships with the major trading nations like the EU, Japan and the US through bilateral and free trade agreements. To some extent, the potential of intra-ASEAN trade was neglected, perhaps with the exception of the entrepot of Singapore. The AEC is an opportunity to refocus trade efforts within the region, especially when Vietnam, Cambodia, Indonesia are rapidly developing, and Myanmar is opening up for business with the rest of the region. The social, cultural, political and business interchange within the region has traditionally been low, until the rapid increase of intra-ASEAN travel, due to the low-cost airline explosion within the region. Today intra-ASEAN trade is approximately 25% of total trade, growing around 10.5% per annum, and expected to reach 30% of total ASEAN trade by the year 2020. However the necessary infrastructure to support intra-ASEAN trade growth is lagging behind with a delay in the completion of the Trans-Asia Highway in Cambodia, and vastly inadequate border checkpoints between Malaysia and Thailand in Sadao and Kelantan. Some infrastructure development projects have been severely hit by finance shortfalls within member states. There are a number of outstanding issues concerning the growth and development of the AEC. The ASEAN Secretariat based in Jakarta has a small staff, where the best talent is lacking due to the small salaries paid. The Secretariat unlike the EU bureaucratic apparatus in Brussels relies on cooperation between the member state governments for policy direction, funding and implementation of the AEC. Thus the frontline of AEC implementation are the individual country ministries, which presents many problems, as some issues require multi-ministry cooperation and coordination, which is not always easy to achieve as particular ministries have their own visions and agendas. Getting cooperation of these ministries isn’t easy. There are numerous structural and procedural issues yet to be contended with. At the inter-governmental level, laws and regulations are yet to be coordinated and harmonized. So in-effect there is one community with 10 sets of regulations in effect this coming January 1st. Consumer laws, intellectual property rights, company and corporate codes (no provision for ASEAN owned companies), land codes, and investment rules are all different among the individual member states. There are no integrated banking structures, no agreement on common and acceptable currencies (some ASEAN currencies are not interchangeable), no double taxation agreements, and no formal agreements on immigration. There is not even any such thing as a common ASEAN business visa. These issues are going to hinder market access for regional SMEs. Any local market operations will have to fulfil local laws and regulations which may not be easy for non-citizens to meet and adhere to. Even though there are some preferential tariffs for a number of classes of ASEAN originating goods, non-tariff barriers are still in existence, which are insurmountable in some cases like the need for import licenses (APs) in Malaysia, and the need to have a registered company which can only be formed by Thai nationals within Thailand. Some of these problems are occurring because of the very nature of ASEAN itself. ASEAN was founded on the basis of consultation, consensus, and non-interference in the internal affairs of other members. This means that no formal problem solving mechanism exists, and the ASEAN Secretariat is a facilitator rather than implementer of policy. Illegal workers, human trafficking, money laundering, and haze issues between member states have no formal mechanisms through which these issues can be solved from an ASEAN perspective. This weakens the force for regional integration. One of the major issues weakening the potential development of the AEC is the apparent lack of political commitment for a common market by the leadership of the respective ASEAN members. Thailand is currently in a struggle to determine how the country should be governed. Malaysia is in the grip of corruption scandals where the prime minister is holding onto power. Myanmar is going through a massive change in the way it will be governed. Indonesia is still struggling with how its archipelago should be governed. There is a view from Vietnam that business within the country is not ready for the AEC. Intense nationalistic sentiments among for example Thais, exasperated by the recent Preach Vihear Temple conflict along the Thai-Cambodian border need to be softened to get full advantage out of the AEC. The dispute in the International Court of Justice over Pedra Branca, and the Philippine rift with China over the South China Sea show the delicacy of relationships among ASEAN members. The recent Thai court decision on the guilt of Zaw Lin and Win Zaw Tun in the murder of two young British tourists may also show how fragile intra-ASEAN relationships can be. The AEC is going to fall far short of achieving its full potential of becoming a major influence in global trade. The AEC is not intended to be the same model as the EEC. The AEC is far from being any fully integrated economic community. The lack of social, cultural, and political integration within the ASEAN region indicates the massive job ahead that Europe had been through decades ago. There is still a lot of public ignorance about what the AEC is, and lack of excitement or expectation for what should be a major event within the region. Respective national media are scant on information about the forthcoming launch of the AEC. Economic nationalism is very strong within ASEAN. Malaysia has its Government Linked Companies (GLCs), State Economic Development Corporations (SEDCs), Thailand its Crown Property Bureau, and family business empires within each country which have vested interests in keeping market access at the current status quo. The AEC is seen as a threat to many existing business empires, which fear open market access. Many of these business empires have enormous political influence upon their respective governments. The AEC could be deemed to conflict with the special advantages bumiputera businesses in Malaysia enjoy in areas of government tendering and contracting. It is yet to be seen how some of these businesses will behave within an AEC environment. However what can be said for sure is that the AEC will not create any level playing field for ASEAN businesses in the foreseeable future. With the problems the EU is currently facing, maybe it is wisdom in hindsight that the leaders of ASEAN have been extremely cautious in their approach to the formation of the AEC. Any opening up of the labour market could also be a potential disaster. A free flow of labour across ASEAN would potentially put many under-qualified people out of work according to Gyorgy Sziraczki, the director of the ILO in Vietnam. This could lead to economic downturns in some of the more susceptible parts of the AEC like Lao PDR and Cambodia. The AEC rather than promoting intra-ASEAN trade, lead to a more domestic orientation, where unemployed may see the informal economy looking much more attractive means of making a living. However, if the leadership of ASEAN see the opportunities of dramatically increasing intra-ASEAN trade, then the AEC has great potential to assist the region withstand any steep economic downturn around the rest of the world. Projects that are able to boost regional synergies like coordination of education, river system water management, energy, transport, banking and finance, may very quickly improve regional integration. Regional clustering can be developed in education, auto-parts, food production, electronic parts, and the value adding of basic commodities to benefit the economies of the region. Infrastructure development will be vital to the success of the AEC. For this purpose the ASEAN Infrastructure Fund, financed by member countries and the Asian Development Bank will be extremely important. The recent ASEAN summit in Kuala Lumpur also reactivated the ASEAN Joint Consultative Committee to resolve trade and investment issues. The slowness of the AEC should not be seen as a failure of ASEAN. We can see the slow pace that ASEAN makes decisions, with the long period it is taking to admit Timur Leste as ASEAN’s 11th member. The vital questions here are whether the AEC will be able attract direct foreign investment to the region? Take advantage of rising opportunities like international education? Stop the talent drain from the region with China becoming more aggressive in attracting the best from the region? and Create an ASEAN awareness within the region? Sadly, one may expect the fate of the AEC to be similar to that of the Indonesia-Malaysia-Thailand Growth Triangle (IMT-GT), and the Brunei Darussalam-Indonesia-Malaysia-The Philippines East ASEAN Growth Area (BIMP-EAGA). They are in existence by name, but with little real substance on the ground. Ah! “Success!” Let’s imagine for a moment that we were discussing this matter with Socrates in the Athenian agora. He would promptly make us aware from the outset that we are assuming we agree on the definition of “success,” and then he would proceed to show that such may not be the case at all, and would accordingly encourage us to define the term or risk arriving at ultimate misguided conclusions. He would probably guide us along (as a mid-wife delivering the baby called truth, to use one of his favorite metaphors, by asking: to whom or for whom does the term apply? Individuals, groups, societies, civilizations? Are the ultimate aims merely gross utilitarian material prosperity, the accumulation of wealth and power, and the free movement of goods; ought they include intellectual and spiritual endowments to be strived for, acquired and appreciated just as much, if not more, as material “goods”?--values such as human rights, democracy, free speech? As this preamble into the definition of success proceeds Socrates would probably also make us aware that the discussion will get nowhere unless we first manage to distinguish “goods” from “the Good” (strictly related to the True and the Beautiful) and he would probably decline to further engage in a pointless conversation on how to successfully augment material prosperity. He would go home. At that point some of us would probably conspire against Socrates as a purveyor of inconvenient truths who has dared to challenge our convenient assumptions; some of us may even begin preparing the hemlock for a trial alleging corruption of the young and vulnerable and disrespect toward religious traditions.